NAIROBI (Reuters) - Kenyan opposition leader Raila Odinga called on Sunday for a strike to support his claim to the presidency and accused the ruling party of "spilling the blood of innocent people" as he brushed off growing pressure to concede election defeat. The election commission on Friday declared President Uhuru Kenyatta the winner of the presidential poll by 1.4 million votes. International observers said Tuesday's vote was largely fair and a parallel tally by domestic monitors supported the outcome. But Odinga's NASA coalition says the whole vote was rigged, and that Kenyatta's ruling Jubilee party has conspired with security forces to crush dissent. 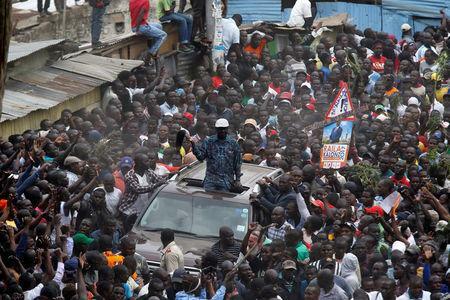 Odinga doubled down on his attacks in a speech to 4,000 cheering supporters in Kibera, Nairobi's biggest slum. "Jubilee have spilt the blood of innocent people. Tomorrow there is no work," Odinga told the crowd, which chanted back "Uhuru must go". He promised to announce a new strategy on Tuesday. Senator James Orengo, one of Odinga's chief supporters, said the opposition would call for demonstrations. "When we people call you to action, peaceful action, don't stay behind," he told the crowd. He also called for a boycott of Nation television and newspapers, Kenya's largest independent media group, over their coverage of the disputed elections. The rally, Odinga's first public appearance since Thursday, made clear he has no plans to renounce his claims of victory despite calls from the international community for him to concede. Police and protesters clashed repeatedly in Nairobi's slums on Saturday. Presidential spokesman Manoah Esipisu laid the blame at Odinga's door. "The violent protests are unlawful," he said in a statement. "The police will not tolerate breaches of the peace. Instead they will protect the lives and property of Kenyans, and they will restore law and order." Sunday was largely peaceful, to the relief of Kenyans who fear a repeat of the ethnic carnage that followed 2007's disputed vote. Around 1,200 people were killed then and 600,000 displaced. Regional trade was also paralyzed and Kenya's economy - the region's biggest - took years to recover. "We are sick and tired of these people stealing the country from us. We need to split this country in two," said David Orwa, 44, hinting at the ethnic rifts that lie beneath the surface of the nation of 45 million. Odinga is a Luo, an ethnic group from the west that has long felt neglected by central government and excluded from power. Kenyatta is a Kikuyu, a tribe that has provided three out of Kenya's four presidents since it gained independence from Britain in 1963. "I want to congratulate Uhuru Kenyatta," Federica Mogherini, foreign minister for the European Union, which did over $3 billion worth of trade with Kenya last year, said. "In line with the African Union, the EU expects the opposition to respect the results and to use legal means available for appeals and complaints." A Western diplomat said the international community was not interested in revisiting a power-sharing deal to end the unrest and stalemate, as happened a decade ago. That avenue was "not an option", the diplomat said. "If you have evidence that the election was rigged, produce it," he said. "Most of the stuff NASA are alleging is not accurate." They later said a secret source within the electoral board had passed them the true election results. That two-page document was debunked by the election commission, which pointed out basic mathematical errors.